Tarawa Marine still MIA, William F. Cowart. Photo from his IDPF and OMPF. Information is current as of 8 March 2019. Caution! I have heard from many overseas researchers that when they have the IDPF for their soldier they are researching or whose grave they have adopted, that they have the entire story. This is incorrect. The IDPF provides information on a soldier for one moment in time. It is usually never the entire story as many soldiers were in more units during their overseas service, than the one listed on the IDPF. Please investigate other records to learn the full story about your soldier. Location, time, date, and cause of death. Location, time, date and place of temporary burial. Sometimes this is an isolated grave or unknown location until after the war. Documents which detail burial, disinterment, final burial information. Handwritten letters from family members. Letters from the military, Congressmen, U.S. military organizations to the family. 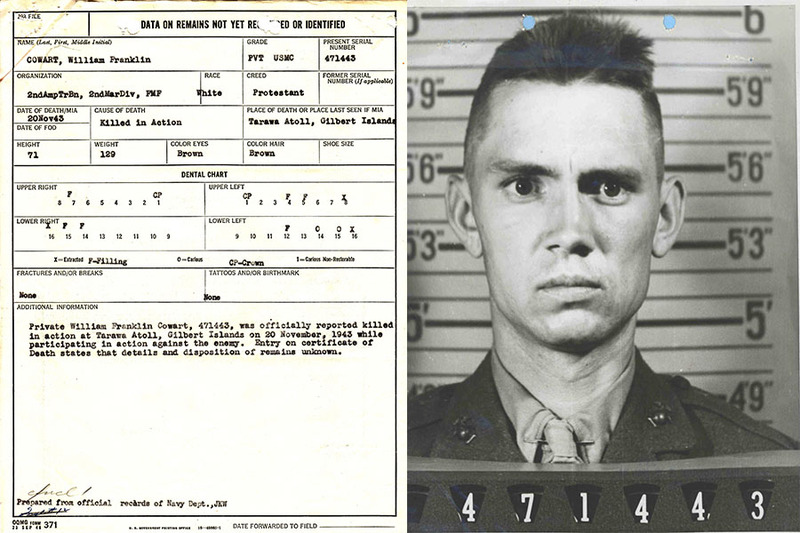 Maps, search area testimony and documentation if the soldier was recovered from a crash site or not located immediately. Dental and physical charts and information. Stateside service training locations and dates. Myth: Some researchers will tell you a soldier’s Official Military Personnel File (OMPF), also known as the service file, was included in the IDPF. This is incorrect. If your soldier’s file burned in 1973 you will not find a duplicate in his IDPF. Specific details from the OMPF may be included, but not always. It depends on the circumstances of the soldier’s death. NAVY and MARINES for the surnames starting with A-L are available to the public at NARA St. Louis. In January 2017, the ARMY (should include Air Force) with the surnames starting with A-L will be available to the public. Cost is .80 per page with a minimum of $20 charge. There is no option at this time for a scanned copy. Paper only. Hire us to have the IDPF pulled with other records available that NPRC will not search for you. We will provide analysis of the file and records obtained to reconstruct your service member’s history and suggested resources to pursue next. Or, download Form 180 and select the box that says OTHER and write in IDPF and wait up to several months to receive the file. Send NARA a letter stating you wish to have a copy of the IDPF under FOIA. State the individual’s name, branch of service, serial/service number, date of death, and birth date. If you have a common name then you might include a little more identifying information. Currently, these files are at the NPRC in St. Louis but are not accessible. We are still waiting for information on when the public can access them. Contact us to discuss a project. I am taking new clients at this time.